A more reasonably priced AVM Fritz!Box, but is it a cut too far? 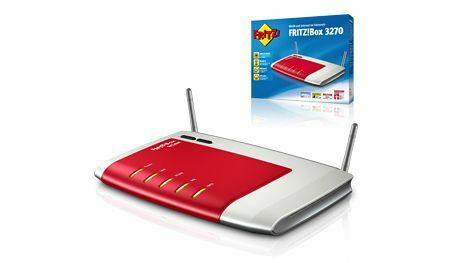 The AVM Fritz!Box 7390 was a massively impressive, if over specified do-it-all wireless router. It also happened to be one of the first dual-band 802.11n routers we'd tested. While that router remains priced in the £200 (around $310) region, AVM has released this outwardly similar device that inside isn't quite as accommodating, with all of the highfalutin DECT, ISDN, SIP and VoIP functions stripped out. Even so, what you have here is a full ADSL2+ DSL router, with dual-band 2.4GHz or 5GHz 802.11n wireless internet, four 100 Base-T ports and a USB 2.0 socket for NAS and printer support. It'll also provide full UPnP media server streaming, and NAS and can run an FTP off it as well. Unusually for an up-to-date design the AVM Fritz!Box 3270 still provides manually adjustable antenna and it's sporting that unmistakable AVM Fritz!Box red and silver style. But can it offer anything over other ADSL2+ dual-band routers such as the Netgear DGND3300? Our key tests run a batch of file transfers over the wireless networking at both 2.4GHz and 5GHz bands using a standard Centrino 2 laptop. Results are going to be limited because it only supports 100 Base-T LAN, but even so we'll run file transfers within the same room, one brick wall away and a line-of-sight distance test of 25 meters.